Sustainable consumption is a central research topic in academic discourses of sustainable development and global environmental change. 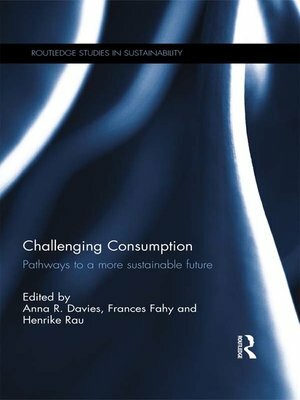 Informed by a number of disciplinary perspectives, this book is structured around four key themes in sustainable consumption research: Living, Moving, Dwelling and Futures. The collection successfully balances theoretical insights with grounded case studies, on mobility, heating, washing and eating practices, and concludes by exploring future sustainable consumption research pathways and policy recommendations. Theoretical frameworks are advanced throughout the volume, especially in relation to social practice theory, theories of behavioural change and innovative visioning and backcasting methodologies. This groundbreaking book draws on some conceptual approaches which move beyond the responsibility of the individual consumer to take into account wider social, economic and political structures and processes in order to highlight both possibilities for and challenges to sustainable consumption. This approach enables students and policy-makers alike to easily recognise the applicability of social science theories.